While there are many ways in which you can streamline the process of cooking rice on the stove, using just the most basic pot with a lid, there are good reasons why I would advise buying an automated rice cooker for private use. The first and most significant reason is that they are so affordable, and at the same time make your life so much easier, that there is no good reason why you should not buy one. Right from the bat, I can tell you that one of the best deals you could make is the Cuisinart CRC-400 Rice Cooker. And here are our other top choices together with the reasons why we are going to review them for you. There are bigger, more expensive, rice cookers on the market, and some of them are definitely worth the money. There are even those that have what you would call impressive features like allowing for a hydrating period before the cooking itself. If you are in the market for something of that sort, you can scroll down and you will find that we have reviewed some of those more interesting rice cookers also, but for now we are going to stick with the Cuisinart because it allows you to cook enough rice for a medium sized family and has all the essential features that you would hope to find without any of the fluff that would increase the price tag. As a huge sushi fan – I actually had to resort to make my own or else I would have literally eaten through my savings – I can tell you that the Cuisinart CRC-400 Rice Cooker is enough for my everyday needs. I do have a couple of other rice cookers around, for one because I simply go through them much faster than your average family, but also because I am a huge fan of this technology. Still, my loss is definitely your gain, because I can certainly share some of the insight I have gained over the years. As I mentioned before, I tend to have sushi at least once a day, in massive quantities, and therefore going to a restaurant each time, even an open buffet style restaurant is simply not an option. In fact I have developed my own style and technique of making a super cheap, extremely tasty, and very easy to make sushi recipe that I will share with you. I call it the Redneck Sushi Recipe, in part as a hat tip to my favorite comedian, Jeff Foxworthy, but also because it actually is a very simple, improvised recipe that you hardly need to visit a specialized shop to do. In it you will actually see me use the Cuisinart rice cooker, and I will go into a little bit of detail about why I think it is such a great choice. If you want a detailed list of the ingredients make sure to check the dedicated recipe article here. Besides my own experience with the various rice cookers I have owned over the years, I have also reached out to different specialists, mostly professional cooks, and I have asked them for their opinions. Given that there are so many similar products on the market, the brands themselves were somewhat interchangeable, but I have picked up on several trends that made me settle on 2 different categories of rice cookers as you will see below. I have further built on the information I gathered from them to give you not only the best choices you currently have on the market, but also several tips and tricks that you need to take into consideration when you pick out your rice cooker. 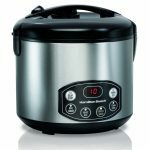 I have already mentioned that in choosing the best rice cooker I relied not only on my own experience but that of several specialists. We actually spent many hours and emails with those that would answer us debating on what the best features should be. There were a couple of common points that most specialists mentioned, and that I found to be entirely useful throughout my long history of going through rice cookers like a tornado through a trailer park. In case you did not know this, or you have not had the experience, let me tell you that the biggest problem you are going to face as a rice cooker owner, or, in fact, as someone who cooks rice on a regular basis, is the fact that rice has tons and tons of gluten. That may not seem like such an important feature of rice, but once the gluten is rendered free through cooking, and if it dries while in contact with the walls of the cooker, it will be very difficult to peel away without damaging them. In fact, let me tell you that I managed to absolutely destroy a cheap IKEA pot, right after buying it, because I did not wash it right away after cooking some rice in it. The next day, as I was trying a little too violently to clean it, I found that the remaining rice would come off the bottom of the pot, but they would peel away some of the nonstick material in the process. So, besides giving you the strongest encouragement I can to always clean the pot of all the rice right after using it, I need to point out that, you should keep a keen eye on the quality of the nonstick material. After a couple of tries you will have enough experience to be able to just see the difference between a good quality nonstick surface and a poor one. In the beginning you can simply run your finger against it, and just choose the one that is the most pours or rugged. The nonstick coating has a texture of its own, while the metal beneath it is very smooth. So the smoother the surface is, the thinner the nonstick layer must be, because what you are feeling in that case is actually the metal beneath. If you were to go right now into any pots and pans shops, you will notice that the thicker the walls of the pots are, the more expensive they are. The reason why you would want to pay more for even a quarter of an inch of extra thickness on the metal of the pot is that the metal will conduct the heat better and distribute it more evenly throughout the cooking process. There is also the fact that metal tends to warp when it goes from hot to cold, in particular if the change happens too fast, but also over time even with the best care. The only way to fight against that is to use thicker metal, as that will not warp as easily as the thinner pots. Here, there is a small caveat in that the pot in a rice cooker does not have to be as thick as one you would use on a stove because it never gets that hot and the exterior walls of the rice cooker are designed in such a way as to keep the heat in. Still, try to keep an eye on that too. Perhaps one of the biggest points of contention in our research – yes, I relay on a research team, I could not do everything by my lonesome – was whether the presence of a steamer should be of any importance or not. You may or may not know this, but most rice cookers also come with their own steamer baskets. I think that they can be extremely useful because many times I may feel too tired to cook some fancy dinner, but I can always pop in some rice, put the steamer on top with some broccoli, onions, beans and chopped egg plants, and dinner is ready. The thing is that some of the experts I have consulted with, do not consider the steamer as an essential part of the rice cooker, so they suggest not taking that into consideration while making your choice. Another essential feature when choosing a rice cooker is the types of rice it was programed to cook. Granted, even the most basic rice cooker will presumably be able to cook all types of rice, but there are some rice cookers that can actually tell the difference between white rice and whole grain rice. My Aurora, for example can be programed to cook either white or brown rice. The difference, as best I can tell, is that with the brown rice the hydrating time is longer because the water needs to permeate the thick outer shell of the rice. The more expensive Zojirushi can actually be programed to cook the rice for sushi and, I have to admit that, when I do use special sushi rice, in the Zojirushi, I cannot tell the difference between it and the stuff we prepare at the restaurant. As no doubt you have realized, my top 2 favorite choices are the Cuisinart CRC-400 Rice Cooker and the Zojirushi Rice Cooker. For that reason, I am going to give you my in depth reviews of both these rice cookers a little further on the course of this article. However, before I get to that, I need to highlight a couple of other excellent choices for those of you who do not need further convincing, but would like to know what other options you have. The Oster CKSTRCMS65 3-Cup Rice Cooker is a brilliantly tiny rice cooker, with its very own steamer basket. It takes a maximum of 3 cups of rice with 3 cups of water, which gives you about 5 cups of cooked rice. That is more than enough rice for sushi that will feed either 2 very hungry people with huge appetites or 3 to 4 people if you restrict yourself to the portions you would receive in a restaurant. The only disadvantage is that the rice cooker is not preprogrammed to let the rice hydrate for any significant period of time, so my personal advice would be to let the washed rice in the water for about 20 minutes before pressing down the button. The Hamilton Beach Digital Simplicity 10-Cups Rice Cooker starts with 10 cups of uncooked rice to produce 20 cups of cooked rice. That is more than enough to feed a party of 10 to 20 people depending on their appetite, although I have to admit that I cringe a little at the idea of using all that rice to make sushi for a party. The Hamilton Beach has separate programs for white rice and whole grain, and it also has its own steamer. The steamer does work better and is more efficient than the one on the Oster and on most other rice cookers, but it cannot be fitted in with the rice so you will need to cook the rice and the vegetables separately. 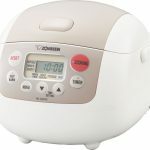 The Zojirushi NS-VGC05 Micom 3-Cup Rice Cooker produces the best results I have seen if you are trying to cook rice for sushi. Ideally you should use special Sushi Rice, but this cooker is so good that, as long as you stay away from the long grain or Basmati rice, it will be able to use regular rice with excellent results. It can also be programmed to cook brown rice, which is to say whole grain rice. It has a spherical inner pan that allows the entire cooker to have a very small foot print and can be easily fit on any cooktop. Being somewhat of a gourmand, I tend to forget that some people do not eat as much as I do, especially if you are living alone. 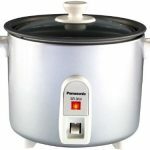 For you there is the Panasonic SR-3NA Automatic 1.5 Cup Rice Cooker. It is just big enough for just one person, but the resulting 3 cups of cooked rice are more than enough for even the largest appetites. They are also enough for 2 medium sized portions of sushi, so you do not have to worry about inviting over a special friend. To begin with let me just say that I did not postpone reviewing the Cuisinart CRC-400 Rice Cooker for so long just to tease you, but because you needed to know what are the features that you should look for when choosing a rice cooker, and you also need to know what other products there are so you will be able to frame our best choice in that context. The Cuisinart CRC-400 Rice Cooker uses 4 cups of uncooked rice to make 7 cups of cooked rice. You can obviously use less than 4 cups if you want, or you can go with the Cuisinart CRC-800 Rice Cooker which uses 8 cups of uncooked rice to make 15 cups of cooked rice. One thing that we need to point out here is that most rice cookers come with their own measuring cup, which you can actually see in the Cuisinart CRC-400 Rice Cooker – Unpacking video below. That cup is pretty standard size for these rice cookers, but it is definitely smaller than what I pictured when I ordered my first rice cooker many years ago. As you can see in the video, but it is well worth mentioning here, in the box you will get the rice cooker, the pot, the steamer basket, the lid, and also a paddle. Speaking of that paddle, I encourage you to use it to fluff up the rice as soon as it is cooked because otherwise it tends to get compacted under its own weight and you will not be able to plate it up nicely, nor use it for sushi. There are several features that I like about the Cuisinart, not the least of which being its brushed aluminum look, which feels modern and clean. I also like the square shape because it is much more countertop friendly and it parts abruptly from the regular roundish shape of most rice cooker, particularly the Asian style ones. This is clearly an American take on the classical rice cooker, and, while it may not make much of a difference in the way it cooks the rice, it is definitely a refreshing change. The most important part of the rice cooker is the pot, and in this case it is made from aluminum with a non stick coating on the inside. The metal is one of the thickest I have seen in terms of what rice cookers use, and the non stick coating is also thick and very well laid on. The one thing that you need to remember is that the coating can get easily scratched and that a second reason why you should always use the provided paddle. Also, if you ever “forget” to wash the pot and the rice dries up, let the pot rest with some water in it for about half an hour before attempting to wash it. The pot is dishwasher safe so an even better alternative would be to always use the dishwasher. The most important part of the rice cooker is the pot, and in this case it is made from aluminum with a non stick coating on the inside. The Cuisinart CRC-400 Rice Cooker has very few high tech features, it does not have any fancy programs, but the upshot is that is very easy to use because of it. It only has a single button that you press down on to begin the cooking process. If you need to cook brown rice, you need to add a little bit more water but that is it. From my own experience with fancier, pre-programmed machines, it is always best if you can afford to let the rice just sit in the water for half an hour, or a full hour for brown rice, before plugging in the machine. It is important to note here that there is no actual on/off switch. You need to press down on the power button to start the cooking process and it pops up to the warming mode when it is done. So, naturally, if you plug it in during the pre-hydrating half an hour I was telling you about, it will actually start warming up the water and therefore start the cooking process. As I have already mentioned the Cuisinart is a very simple rice cooker, so I will not go into that here, since the simplicity feature can be a desirable trait, and it is well reflected in the price. More importantly, if you want a fancier rice cooker, you can simply go with the Zojirushi NS-LAC05XT Micom Rice Cooker that we have reviewed below. The biggest problem different reviewers have had with the Cuisinart is the fact that water drips over the lip of the pot and all around the rice cooker itself. Having used close to 10 different rice cookers so far, 5 of which I have personally owned, I can tell you that is a common problem of all but the most expensive rice cookers. 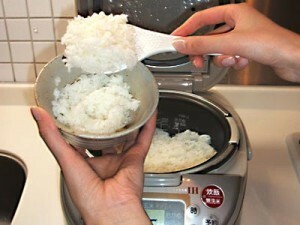 However, the reason for it does not have so much to do with the rice cooker, but more with the rice itself. During transport from the packaging factory to the store you pick it up from, the grains of rice rub one against the other and the form a very fine powder. That powder is very difficult to wash if you just rinse it a couple of times in the pot, and during the boiling process it creates a foam that flows out of the pot. The solution is incredibly simple, and I actually got it from a friend in Japan. There they use a large sieve to wash the rice thoroughly until the water comes out clean on the other side. 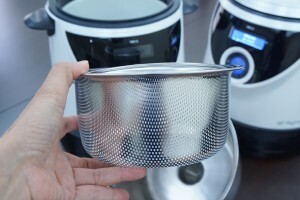 You can check out this small article where I talk about some of the best sieves you can currently buy, if you want to implement the Japanese solution. As you probably have guessed while I am not quite a redneck I am a big fan of the redneck philosophy of not fixing it if it ain’t broken. For that reason I am not that impressed with the host of features you get with the Zojirushi rice cooker, but there are so many of them that I am sure some of you are going to be quite impressed. In fact I actually own a Zojirushi too, but I just don’t use it that much since it takes somewhat longer to cook the rice. The big reason why it takes so long is that the Zojirushi has several different programs dedicated to perfectly cook the rice. And not only that, but it has different programs for different types of rice, and I have actually gone into quite some depth detailing for you the different types of rice that you may want to use. So, assuming that all you know or care about is white rice, once you press the start button, the Zojirushi will let it soak for half an hour, it will then go on with what is a normal cooking process, and then it will let the rice sit for another 15 minutes to steam. However sometimes I do not care for all that presoaking and steaming and I like to just get the rice done, at least 90% of the way, and eat it like that. In reality the difference is not that great, unless you are as much a rice aficionado as the snootiest Frenchman would be about wine. The second reason why the Zojirushi is definitely worth the money is the pot which uses a clearly superior non stick layer on the inside. There is also the thickness of the metal that conducts heat a lot better than even the one in the Cuisinart. It may not seem like much but the point is that this pot will last a lot longer than your average rice cooker pot, and, given that the rest of the components that go into making up a rice cooker are virtually bullet proof, you can be sure that this will likely be a once in a lifetime investment. The thickness of the pot also means that the rice will cook evenly, which, together with the presoaking and other stuff means you will get a rice that is truly of superior quality. To conclude the positive things that can be said about the Zojirushi NS-LAC05XT Micom Rice Cooker there are a few more miscellaneous features to mention. First is that this is the 3 cup rice cooker, but there is also a 6 cup one. With it you get the rice cooker itself, the measuring cup, which you will absolutely have to use because you can only add water according to the gradations drawn on the side of the pot, and those were done to match the size of the cup. You also get a non stick spatula and a spatula holder. Other features to consider are the fast cooking program for the rice that shortens the soaking periods, but it does not remove them all together. There is also a porridge menu that will double the uses of the rice cooker, provided, of course, that you are the type of person who would eat porridge. Finally, and you probably have noticed this already, the interface with the machine is much fancier, it even has an LCD screen, and you get to choose between different programs. As you have probably gathered if you actually took the time to follow me to this point, I am one of those who believe that a rice cooker is a useful tool in the kitchen, but I am not overly found of spending too much money on buying one. There are several reasons why I believe this, not the least of which being the fact that, although there are many tips and tricks that can help you cook the perfect sushi rice on the stove, most people do not know those tips or do not care to implement them every time. For that reason, often enough the rice will either disintegrate as you go to dip it in the soy sauce, or it will get burned. 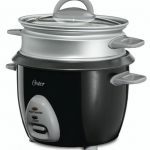 There is a second reason why I encourage all of my friends to buy a rice cooker, even if it is the Oster CKSTRCMS65 3-Cup Rice Cooker, which is to say the cheapest one on this list. There are semi glamorous jobs in the kitchen and there are boring jobs. In the business, we call the guys doing the boring jobs sous-chefs. They dice the onions, prepare the sauces, cook the rice, bake the breads and a lot of other jobs like that for which they have to come in several hours before the cooks. Once you have everything at hand, putting everything together so that it will be a pleasure to eat, can actually be fun, or, if you are inclined to it, can be glamorous. The point is that a rice cooker can be your sous-chef, and then you will grow to discover that sushi, or many other dishes that are usually served with rice, are actually better at home. Unless, of course, if you live in Trondheim! Then the best sushi is served at the Sushi Bar and you need to keep coming in. A rice cooker is, in effect, a very simple heating element connected to a circuit board that heats up that element to special temperatures and for specific periods of time depending on how complex the circuitry is. That means even the cheapest rice cooker can easily work for at least 10 years, with proper care. That proper care refers, first and foremost, to the care you take when cleaning the cooking pot. The nonstick material can come off, particularly if you try to scrape the rice off of it. If, for some reason you find that rice has clumped up on the bottom, perhaps there is even some burned rice, it is crucial that you take your time and just leave the pot, filled with water and some dish washing liquid, overnight to soak. After about 12 hours even the most stubborn pieces of rice will float away freely. 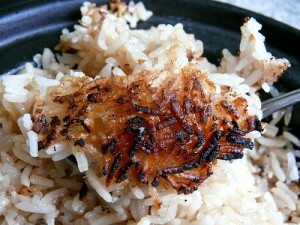 That is, of course, if you have not burned the rice too badly. Because you are using a rice cooker though, that is very unlikely to happen. The only reason why the rice might burn is because you forgot to add enough water. The basic recipe for white rice is two parts water for one part rice, and that is so simple and easy to remember that you literally have no excuse for burning the rice once you have read that statement. The other thing that tends to go bad with time is the bottom of the pan. Because the heating element is right underneath, it takes the heat and distributes it through the walls and into the rice. Because the temperature rises slowly that, in itself, should not be enough to damage the pot. But what some people do, is they empty the rice on a plate or in a bowl, and then they will fill the pot with water. The problem is that even hot tap water is usually below 122 degrees, that is 50 degrees Celsius for the rest of the world, while the bottom of the pot may still be closer to 212, which is to say 100 degrees Celsius, or even higher. That fast temperature change can easily begin to warp the bottom of your pan, no matter how thick it is. The more of the story being to let the pot cool down until it is pleasantly warm to the touch or even cooler than that before you go ahead and wash it. Although you can see me using a rice cooker in the video above with my hillbilly sushi recipe, and there is another video that you can find below focused just on how to use a rice cooker, it may be a good idea to write down the steps as well. First up, you need to know that the basic recipe to be used with all rice cookers is 2 parts water for every 1 part of rice. You can scale that up to 4 parts water to 2 parts rice, and so on. Second you need to wash the rice thoroughly. Ideally, you should have one of these bit sieves that you can find in this short article, but you can also just wash it in a bowl as well. If you are going to take that latter choice, my only advice would be to take your time and really keep rinsing the rice until you can clearly see the rice through the water, and I mean each individual grain, and the water is no longer foggy at all. Lastly, drain the rice, put it in the rice cooker and add the appropriate amount of water. Here, I need to point out that you should really follow whatever recipe your rice cooker came with. In particular brown rice will have different recipes, although my favorite is 3 parts water to 1 part rice. However, white rice may have a different recipe with a different machine than the ones I have tested, so make sure to check up on that as well. As far as seasoning the rice is concerned, I like to leave it as it is, not even adding salt, because rice is great at soaking up the flavor of whatever food it comes in contact with. However, if you feel the need to add some salt, make sure to add it in the beginning with the water, so that it will get soaked up in the grains of rice themselves, and also to avoid bruising the grains too much through stirring at the end. I have been trying to convince you to get a small rice cooker for your kitchen throughout this article and I will not continue to peddle that here. However, I do have small request. Hit us up in the comments section with whatever questions you might have about the use of rice cookers and the various types of food you can get with their help. We think of this article as a work in progress and we may add to it, either with written or with video advice if there is anything that we find most of you are wondering about. Obviously, we also need to apologize for the captcha filter, but we have found that most often than not various bots tend to spam us with content and that can blind us to the real comments from you. Thank you for staying with us until the end, and let us know how your rice cooking experiences turned out to be! I’ve used a good many rice cookers over 55 years but have lately used the Cuisinart and, even more recently, the Wolfgang Puck (Tayama) 1.5 cup because I usually only need to make 1 cup of (uncooked) rice at a time, and even the Cuisinart is larger than necessary. My original college 8-cup rice cooker didn’t have a non-stick pot (hadn’t been invented yet) so I had to soak it overnight to enable easy cleanup. Not a huge deal but I thought it was about time I moved into the 21st century with a non-stick pot. Besides making 1 cup of rice in an 8-cup cooker seemed like a waste. I started to use brown rice several years ago because it’s healthier and find that I don’t need to rinse it very much, if at all, unlike white rice. As you’ve noted, almost all rice cookers tend to bubble out of the steam vent (unless it’s completely sealed, as in a pressure cooker), making a bothersome mess requiring cleanup time, especially irritating on the attractive stainless steel finish of the Cuisinart. But I found that adding a teaspoon of vegetable oil per cup of rice minimizes that problem. It was suggested in one of the manuals, I don’t remember which, but it seems to work well and I’m glad I took note of that part of that manual. The Puck cooker has an inner lid liner which provides an additional baffle preventing spattering out the steam vent but adding the tsp. of oil guarantees that only pure steam vents out. Another little detail: the measuring cups for rice cookers are all 3/4 size so “1 cup” of dry rice is actually 3/4 standard kitchen measuring cup. With 1 cooker measuring cup of brown rice in the Puck cooker, I fill water to the 1.25-1.5 cup line marked in the pot and results are always perfect. (With white rice, I would fill to the 1-cup line.) Therefore, if you used a standard kitchen measuring cup to measure 1 cup of dry rice the water markings on the pot won’t apply. I had also looked at the Perfect Cooker, which is similar to the Puck but bought the Puck (plus one for my daughter) for no particular reason (the choice seemed to be a tossup). They both cost about $20, so no big loss if it didn’t work out as anticipated (compared to fancy expensive cookers out there). However, I’ve been pleasantly surprised at my continued satisfaction after using it almost daily for a year now…certainly worth the small $20 investment. P.S. I read in a review of the Cuisinart that they recommend using the steamer tray, even if you’re not steaming anything, to reduce the foaming bubbling-out problem. In rice cookers provided with such a steamer tray, it may be wise to use it all the time. As I mentioned above, the Puck has a lid insert which seems to perform a similar function.